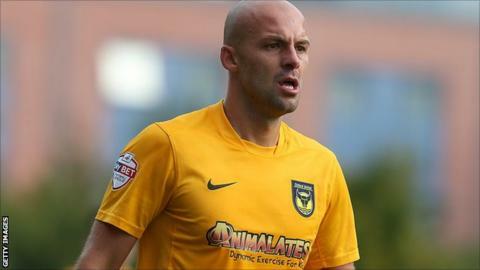 Oxford United defender David Hunt says the players are "frustrated, upset and embarrassed" after missing out on a League Two play-off place. Saturday's 2-1 defeat by Accrington ended any hopes of the play-offs, having been top in mid-December. "The lads are down, we know what we could have achieved and we didn't," Hunt, 31, told BBC Radio Oxford. "We are frustrated, upset, embarrassed. Nothing can change that now, we have to live with it and learn from it." The U's have also lost six of the seven games since new manager Gary Waddock took charge of the club in March. They end their season with a trip to Northampton Town, managed by former U's boss Chris Wilder. And Hunt has urged the U's to end their disappointing season on a high. "We're playing for pride," he said. "Firstly for ourselves and then the whole club and the fans. "The last third of this season has been very disappointing for the lads and everyone involved. "We know how the fans feel, and rightly so, the run we are on is unacceptable. We are as disappointed as they are and the lads are hurting. We want to try and end on a positive note."